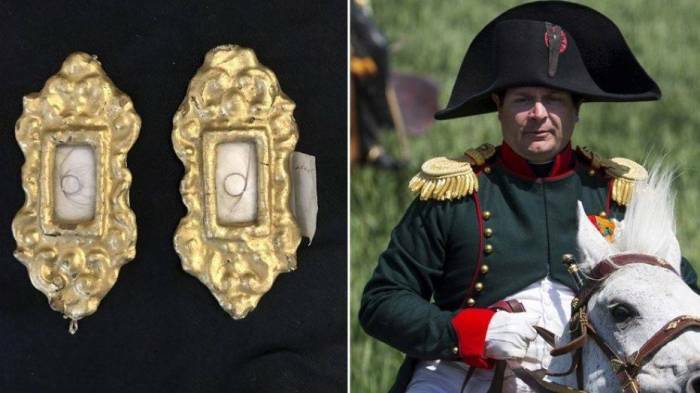 A host of historic artifacts, including a lock of Napoleon’s hair, will be up for auction in the U.K. on Saturday. The unusual object is in an early 19th-century composite locket frame with a lock of hair from Napoleon’s wife, Empress Josephine. “These are remarkable history,” auctioneer Andrew Aldridge of Henry Aldridge & Son told Fox News. Josephine de Beauharnais was Napoleon’s first wife and Empress of the French from 1804 until her divorce from Napoleon in 1810. The lot has a pre-sale estimate of $892 to $1,530. Napoleon is one of the key figures in European history and remains a source of fascination to collectors. An extremely rare ‘bicorne,’ or 2-pointed hat, that was worn by the French leader at the Battle of Waterloo was recently sold at auction in France for $325,000. The locket frame containing the locks of hair is part of an eclectic set of artifacts amassed by the late collector David Gainsborough-Roberts. Another item of from his collection up for auction on Saturday is a fragment of cloth reputed to come from the flag of HMS Victory, the flagship of Napoleon’s nemesis Admiral Nelson. The lot has a pre-sale estimate of $1,275 to $1,913. Other artifacts from the Gainsborough-Roberts collection in the auction include a leather-covered makeup box that belonged to Mae West and silver enamel compact that belonged to Audrey Hepburn. The makeup box has a pre-sale estimate of $1,275 to $1,912 and the compact has a pre-sale estimate of $1,912 to $3,187.